Airport security is a weird, weird thing. Leave your water and your regular-sized shampoo bottles at the door, but by all means, if you’ve got a big lobster that’s still alive, come on down. Bring that sucker right through security and onto your plane as a carry-on item or a checked bag, because claws aren’t dangerous, just delicious. 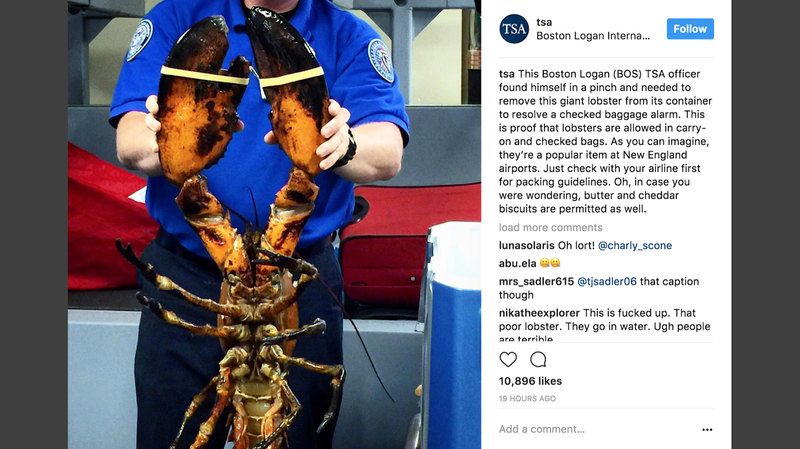 The TSA posted a photo of one such giant lobster on Instagram the other day, saying an agent in Boston had to unpack a checked item in order to investigate a baggage alarm. The checked container looks to be the cooler next to this poor thing, who the Houston Chronicle reports was still alive when making its way through the baggage scanner. Besides the depressing thought that this unlucky lobster had to ride in a cooler in the cargo hold of a plane for however long, the TSA said something truly wild in its Instagram post: You can bring a lobster in a carry-on item if you want. The Chronicle reports that this one was 20 pounds, and just look at the size of those clampers. That’s exactly what you want hanging out in the cabin with you. It’s weird to think lobsters are allowed at all and that the TSA would publicize it, since the agency plans to crack down on security checkpoints soon. But that’s likely to no avail, because the TSA isn’t great at finding dangerous stuff anyway. So don’t fret about the lobster! Wave at the poor thing as it goes by! We all learned a great lesson here. When it comes to boarding a plane, you can’t bring the fruity drink you bought at a pee stop on the way to the airport, you can’t bring big teddy bears and you can’t bring weapons—if the TSA catches them—but tell that lobster to hop on board, for sure. Don’t even sweat it.